Viruxol (60 tablets)- Save-On Nutrition Centre Ltd.
Plants are a valuable resource for the discovery and development of novel, naturally derived agents to prevent and treat virus infections. 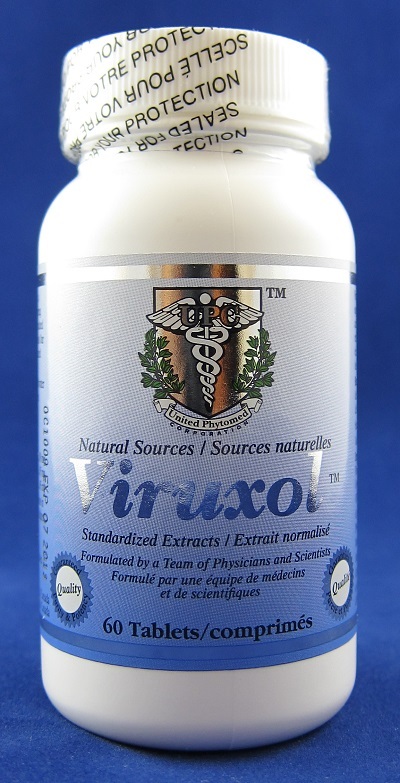 Viruxol is a synergistic combination of powerful natural anti-viral antioxidants derived from edible plants. Demonstrates to have strong anti-viral function. Can inhibit virus expression and replication in vitro in chronic virus infection, acute infection and transmission models. Disrupts the virus replication cycle. This Inhibition will be greater after pretreatment with Viruxol than with ferulic acid, vitamin E, and curcumin. Acts as SOD like molecules with a-sod like activity and possesses the activity on superoxide anion production. Possesses the cytoprotective functions and protects leucocytes. Contains immune enhancing polysaccharides (high molecular weight heterogenous polysaccharides) which can enhance the body's general immunity. Increases the total number of lymphocytes and helper T-cells or the activity of natural killer cells or macrophages. Increases the number of immune stimulating messenger molecules known as cytokines (e.g. interferon, interleukins) and also increases CD4, CD8, and T lymphocytes. The active ingredients in Viruxol have been shown both in animals and humans to be hepatoprotective and useful for treatment of hepatitis and cirrhosis. Note: For Physicians and Health Care Professionals Only.